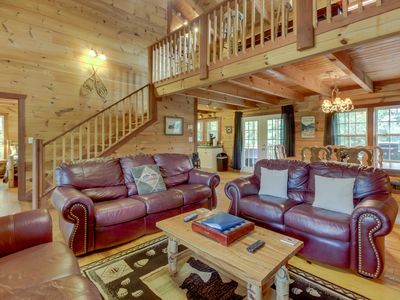 Dog-friendly mountain home for the next family getaway w/ hot tub & more! 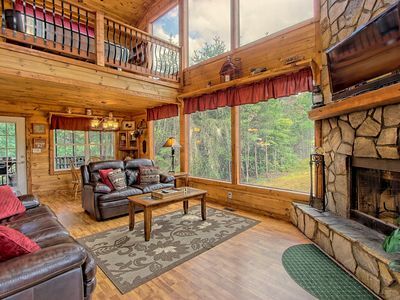 Get ready for an unforgettable Sautee Nacoochee vacation with this dog-friendly home! 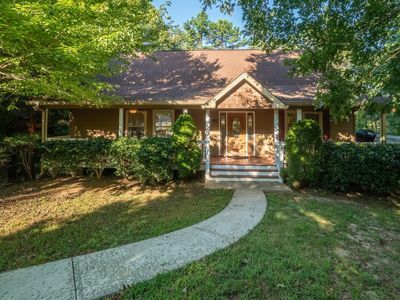 A great location, plenty of room, and amenities like a hot tub, and pool tables, and an outdoor firepit make this perfect for families and groups of friends. 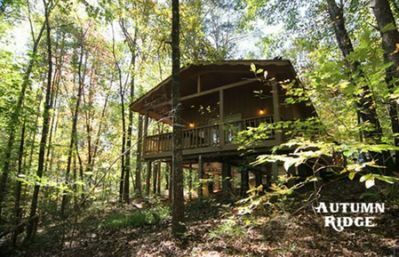 This Chattahoochee National Forest home for 10 is ideal for groups looking for some peace and quiet in the great outdoors, with easy access to activities like rock climbing, biking, kayaking, and hiking. There's also shopping and dining to experience in the Bavarian village of Helen just nearby. 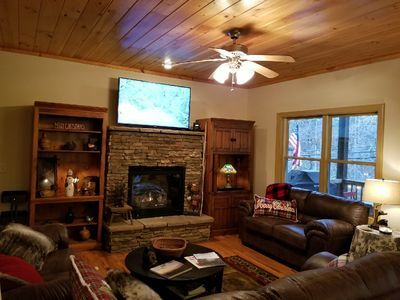 The living room is ideal for relaxing as a group, with a fireplace for cold winter days, high-speed WiFi, and a 42-inch cable flatscreen TV with a DVD player. 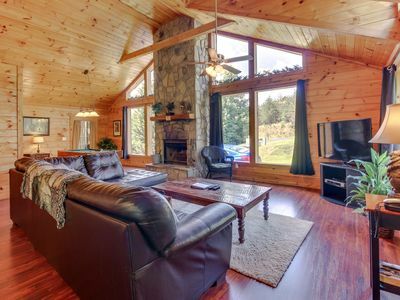 The room also provides easy access to the game room upstairs, as well as the hot tub on the screened-in back deck! 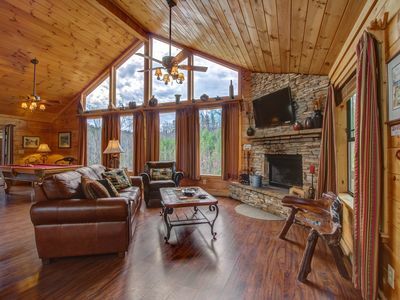 Whether you dine at the seating for ten indoors or enjoy outdoor meals by the grill or firepit, you'll love meals prepared in the fully equipped kitchen. Modern appliances, ample counter space, and plenty of cookware come together to make this a great space for cooking. 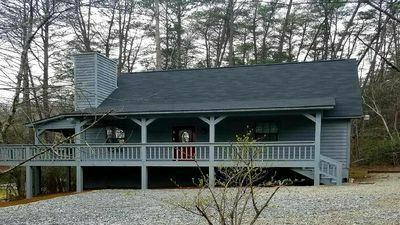 Ten lucky guests (and three dogs, for a small nightly fee) can enjoy this home's three bedrooms and baths. 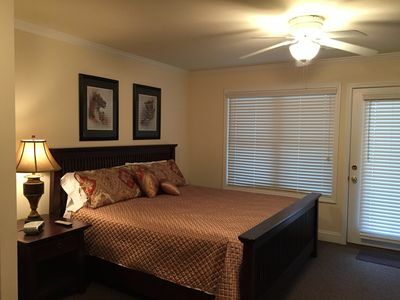 The master suite offers a king-size bed and en suite bath with a jetted tub, while the remaining two rooms boast a queen-size bed and two full-size beds, respectively; two twin rollaway beds round out the sleeping options. The bath's roomy showers, along with the private washer/dryer, will keep everyone nice and clean during their stay! 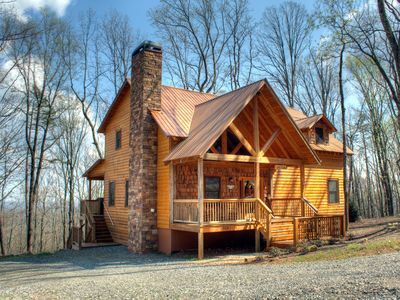 Every day is an adventure with this amazing cabin! 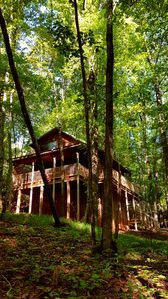 From hikes in Unicoi State Park or Smithgall-Woods Dukes Creek Conservation Area to fishing and swimming in the Chattahoochee River, there's plenty of natural beauty all around you waiting to be explored. 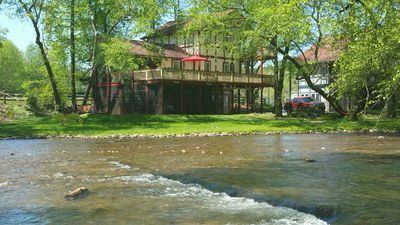 Helen also offers a wide variety of activities, from exploring its many wineries to panning for gold at the Gold Mines of Helen. 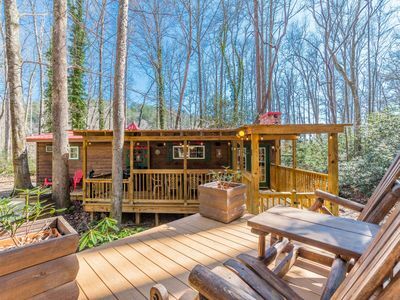 Why wait on that perfect Northern Georgia getaway? Place your reservation today! Please note: Minimum renter age is 25 years old. This applies to ALL GUESTS that will be occupying the unit with the exception of multi-generational families. Parking Notes: Motorcycles and trailers are allowed at this property. 2 Master BR; Seasonal Mt. 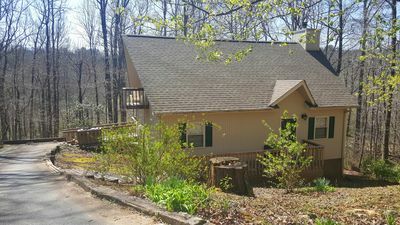 View; Deluxe Cabin Near Helen GA! 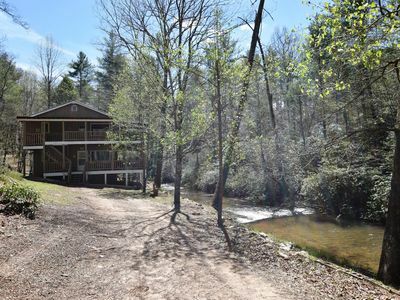 SECLUDED CABIN ON CREEK * 1,800 feet from DOWNTOWN HELEN ! 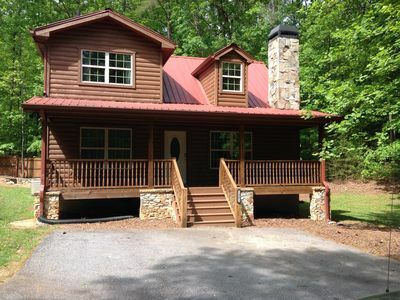 Beautiful Cottage with loft, creek, hot tub, fire pit, and free wifi!!! 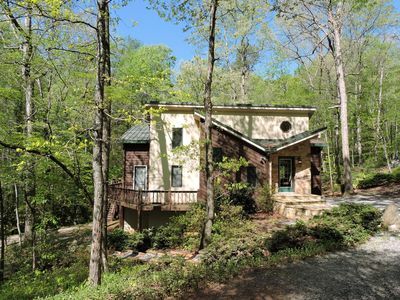 "Wine Down the River" Overlooking Trout Stream - Free Wifi! 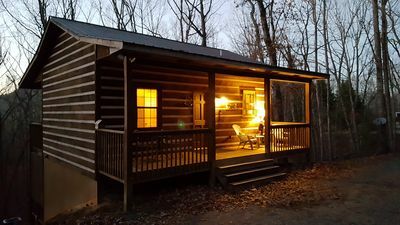 Rest & Relaxation Cabin, Cozy Romantic Getaway - Free Wifi! Falling Waters with Stunning Waterfall Views! - Free Wifi! 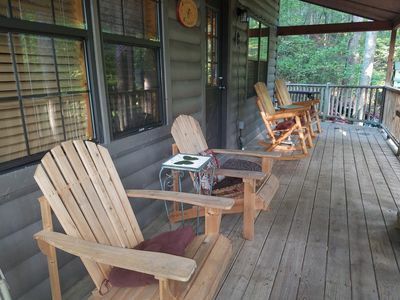 Gorgeous dog-friendly cabin w/mountain views, hot tub, sauna, pool table & more! 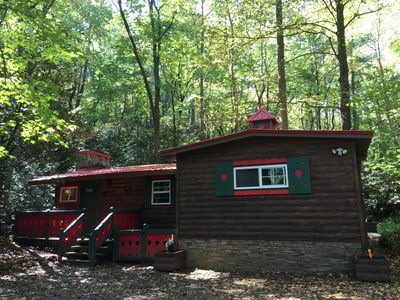 Dog-friendly cabin w/ hot tub & jetted tub - perfect for a romantic getaway! 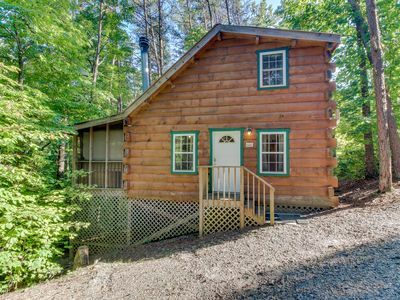 Updated cabin-style mountain home w/ sauna, private hot tub, dogs OK! Mountain Experience with town convenience!